The conditioning and brainwashing that the Handmaids go through is that they are convinced by the Aunts that they are free. There is a distinction between freedom to and freedom from. Freedom to existed before Gilead when women had freedom to work and be independent and have their own money and could even have sexual freedom. Freedom from is Gilead’s justification that now that the republic is established, you’re free from rapists and harassment and free from the constant fear for your own safety or from the constant upkeep you would undergo to attract a mate and free from all the burdens that come with independence. In this way, Gilead establishes it’s theocratic rule and appears as the savior of women rather than the oppressor. Offred desires Luke to make her feel valued, in essence she needs love and a man who knows her to truly value her. Offred then catches herself objectifying her own self and instead says her own name to value her own self and remember how she was once a powerful and superior woman. 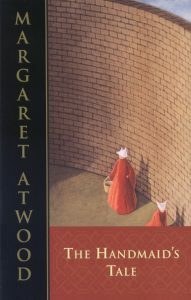 It seems that Offred has an ambivalent nature in which she seeks to be valued by the men around her but then she also seeks her own approval and independence. She wants another man to complete her but then again she also wants to be whole by herself. Offred is stuck between passive and active. Offred poses the idea that forgiveness is power. That she is not concerned with those in power but those who are given the power to continue to make mistakes and commit horrible crimes simply because one forgives them. It is a warning to society to not be so forgetful of mistakes because that allows someone to forgive and allows the transgressions to keep happening again. When Offred remembers her mother, she remembers a harsh feminist who wanted to shape her into the way she wanted to be and instill her own ideals into her and even live through her. This is a criticism that even feminists at times reproduce their own gender roles and societal pressures expectations on other women. Atwood could be suggesting individualism rather than feminism because no two women will be replicas of each other.